BruxZir is an excellent crown material; crowns look good, and so far I have had no failures after four years of regular use. Great implant crowns – they are opaque enough to mask the metal abutment but still look good. I love the way three- and four-unit bridges fit and look. No fractures at four years. The purpose of this evaluation is to report on the clinical performance of BruxZir Solid Zirconia Crowns and Bridges at four years. A total of 1,392 BruxZir Solid Zirconia Crowns and Bridges (Glidewell Laboratories) restorations have been placed over the past 56 months. Nine hundred and thirteen (913) restorations were recalled over four months including: single crowns (84%), 7% of which were implant crowns, and 16% that were 3- and 4-unit bridges (Figure 1). Of the 913 recalled restorations, 5% were anterior crowns and 95% posterior crowns. All restorations were cemented with adhesive and self-adhesive resin cements. The majority (85%) of the restorations were fabricated by Glidewell Laboratories, while 15% were fabricated by Apex Dental Milling. Of the 913 recalled restorations, 18% were over 4 years old, 35% were between 3 and 4 years old and the remaining 47% were less than 3 years old. The esthetics of BruxZir Solid Zirconia Crowns and Bridges (Glidewell Laboratories) was rated excellent (Figure 3), based on the consistency of the shades and a comparison of the esthetics to other monolithic zirconia restorations. BruxZir (Glidewell Laboratories) tends to be less opaque than other zirconia restorations. Only 19 (2%) of the BruxZir (Glidewell Laboratories)restorations received a rating of 4. BruxZir restorations were not compared with layered ceramic restorations. BruxZir (Glidewell Laboratories) restorations are perfect for patients looking for more monochromatic and whiter teeth like a B1 shade. The new BruxZir 16 pre-shaded zirconia and Anterior BruxZir further improve esthetics. Note: THE DENTAL ADVISOR is now beginning a one-year recall of Anterior BruxZir restorations. Chipping and fracture of BruxZir Solid Zirconia Crowns and Bridges (Glidewell Laboratories) single crowns have been practically non-existent (Figure 3); three failures (0.3%) were observed. A second molar crown fractured, but failure was likely due to a lack of occlusal clearance and insufficient reduction. Having less than 1 mm of clearance is not recommended for molars. Two implant crowns on lower second molars fractured and one had to be replaced. The failure was again due to very low clearance and insufficient space due to implant placement. In one case, the abutment also failed. None of the three- or four-unit bridges fractured. 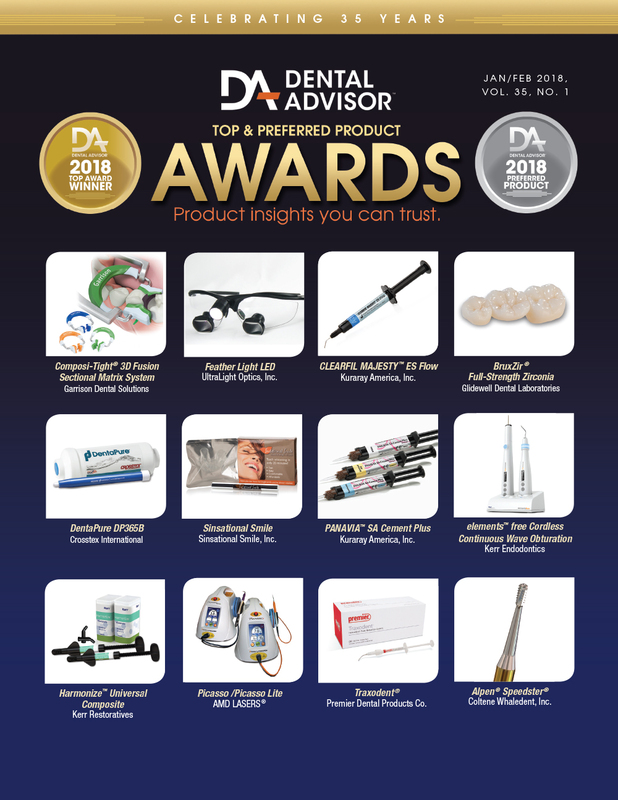 THE DENTAL ADVISOR has been documenting the failure of ceramics for over 30 years and BruxZir has by far the lowest failure rate at four years. 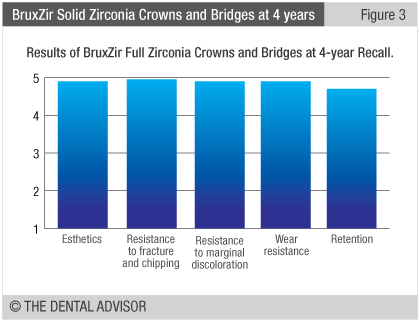 Only five of the BruxZir Solid Zirconia Crowns and Bridges (Glidewell Laboratories) restorations (0.5%) exhibited slight marginal discoloration at four years (Figure 3). The opacity of the crowns helps camouflage most staining or microleakage. Also staining is a function of the bonding agent or cement rather than the zirconia. Almost no wear was observed on BruxZir Solid Zirconia Crowns and Bridges (Glidewell Laboratories) restorations and very minimal wear was observed on opposing nautral dentition at four years (Figure 3). More wear was visible on gold crowns opposing BruxZir restorations. 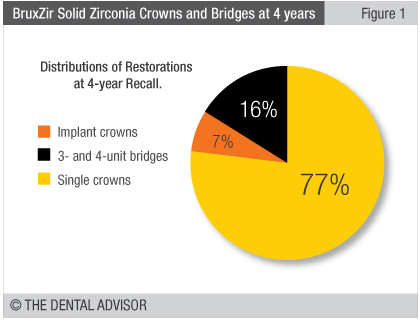 Thirty-nine crowns (2.8%) out of the 1392 BruxZir Solid Zirconia Crowns and Bridges (Glidewell Laboratories) crowns debonded and required recementation (Figure 3). This debonding rate is slightly higher (2.8% vs 2.0%) when compared to non-zirconia crowns that THE DENTAL ADVISOR has documented over time. Regular use of zirconia primers could result in a reduction of the debonding rate. 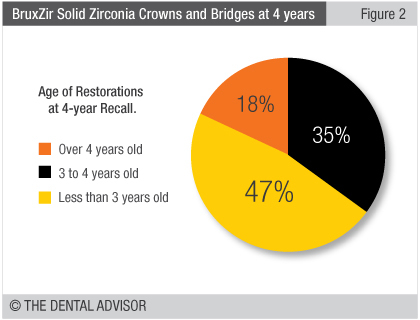 Over the four-year evaluation period, BruxZir Solid Zirconia Crowns and Bridges (Glidewell Laboratories) have proven to be excellent restorations with respect to esthetics and dependability. 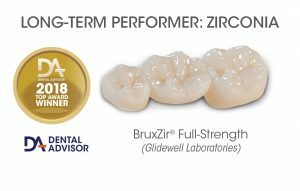 BruxZir Solid Zirconia Crowns and Bridges (Glidewell Laboratories) received a 98% clinical performance rating.